Even if for some Agile and Scrum practitioners, checklists can have the bad reputations as being on the wrong side of the “Individuals and interactions over processes and tool ” Agile Manifesto preferred values, it doesn’t always mean that it contains “items you should always check”. They can be also considered as a good practice that allows to capitalize and share experience when they are used as guidelines to assess the different aspects of a situation. This article presents various websites, articles and blog posts that suggest checklists for ScrumMasters. The main reference is scrummasterchecklist.org and many web sites just reference this content. We tried to uncover different perspectives on this topic. I hope their content might help beginning or experienced Scrum Masters consider their work with a different perspective. Feel free to suggest any content that I missed and that should be featured in this article. 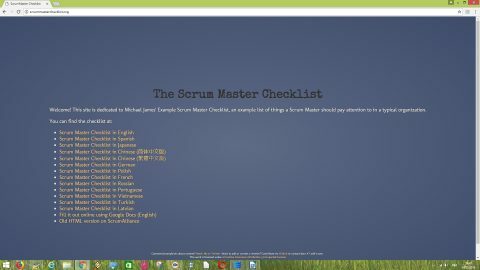 This site is dedicated to Michael James’ Example Scrum Master Checklist, an example list of things a Scrum Master should pay attention to in a typical organization. This list is translated in multiple languages (Chinese, Japanese, German, French, Spanish, etc.) Some of the items mentioned in this list are “Is the backlog an information radiator immediately visible to all stakeholders?” or “Are there issues/opportunities the team isn’t discussing because they’re too uncomfortable?”. 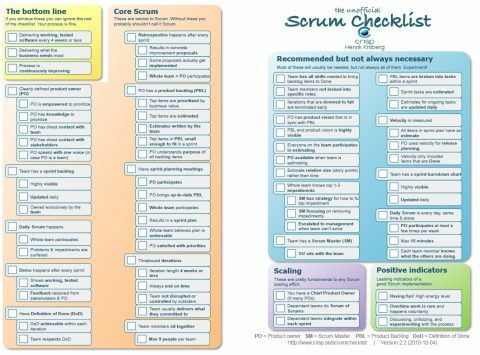 The Scrum checklist is a simple tool created by Henrik Kniberg that provides guidelines to help you get started with Scrum or assess your current implementation of Scrum. Some of the items mentioned in this list are “Team has a sprint backlog that is updated daily” or “Velocity only includes items that are Done”. These ScrumMaster checklists are interestng resources, but I encourage any ScrumMaster or Scrum Team to build its own version. This is like the Definition of Done (Dod), they must be the result of your own considerations about your specific context.